Kia’s cars come with bags of style that easily match their European rivals and the new Kia Rio is no exception. It’s a compact hatchback that offers sharp lines and fascinating details that make it seem quite sporty. 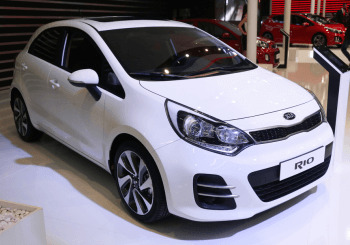 All new Kia Rio models are equipped with body-coloured bumpers and other fitments, although you’ll need the higher-end models if you want chrome grille surrounds and alloy wheels. It’s easy to get comfy in the Kia Rio. Every model comes with height-adjustable driver’s seat and most have steering that adjusts two ways. The buttons are pleasantly chunky and the controls simple to manage this makes the layout of the dash a dream. Smart? We should say so. All the models come with interior high-gloss black plus silver air-vent surrounds. It’s a sturdy interior and one of the biggest in its class. That means that adults get decent leg room, especially in the back. Storage-wise the boot will do you fine with its 288 litres and the rear seats gets the handy 60/40 treatment. On the road, the Kia Rio handles with stability. Powering it along are a choice of four engines. Two petrols, a 83bhp 1.25 and a 107bhp 1.4-litre offer relaxed driving. If you’re after a diesel, you can choose from the 74bhp 1.1 and the 89bhp 1.4. What about running costs? The Kia Rio isn’t the cheapest in its class, but running costs are excellent. If the thought of 88mpg appeals, you’ll want the 1.1 CRDi Rio in basic ‘1’ trim. It also comes with CO2 emissions of 86g/km. That’s what you call frugal. Even on the 1.4 CRDi, you’ll achieve over 70mpg and kick out just 98g/km in emissions. The petrols will give you more than 50mpg. Kia’s reliability is legendary, something helped in no small part by the seven-year/100,000-mile warranty. Owners report remarkably few faults with Kia. There are plenty of the last-generation Kia Rio, launched in 2005, still going strong. So you would think that the new model will be even more dependable. Safety-wise, you’ll be glad to know that the Kia Rio gained five stars from Euro NCAP. Factors in this include anti-lock braking, an electronic stability programme and hill-assist control. It’s awash with airbags and there are Isofix child-seat anchors and even a system to monitor your tyre pressure. There’s plenty other kit, too. All five trim levels get daytime running lights, DAB radio, Bluetooth and electric front windows. Probably the best value is the 2, which gets a chilly glovebox, front fogs, alloys, leather central armrest and steering-wheel covers. The main event with the 3 is touch-screen sat-nav, and the 4 adds leather seats, keyless go and a heated steering wheel. Interested in a Kia Car ? You can take a look at the Kia range at our Kia Weston super Mare dealership.